While friends are congratulating me on the publication of Iqbal - Tashkeely Daur, 1905-13, some have also asked the unavoidable question: Why a new biography of Iqbal when so many are already in print? 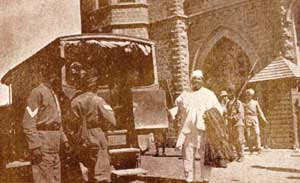 We hear about people condemned for starting wars, but Muhammad Ali Jauhar (1878-1931) was tried and imprisoned for attempting to stop a war: the First World War (1914-18)! In 1914, Britain wanted the Ottoman Empire to fight on its side and the London Times wrote a leading article to this effect. As a subject of the British Empire, Jauhar could not openly ask the Turks to stay away, so he offered a balanced advice in a 40-column long article in his English daily, Comrade, on September 26, 1914. We desire from the bottom of our heart that this may be the last of the wars, and that human intelligence and human sense of justice may never know such constantly recurring eclipses. But we are bound to admit that as things are today there are some things worse than war. We shall not, therefore, pretend to believe that the Turks must have peace at any price. They must beware of entering into a quarrel, but once in it they must not come out of it till the claims both of honor and self-interest are satisfied. God knows they will have enough occasions to fight, for they have to contend against numerous army corps of prejudice and passion. That is all the more reason that they should fight only their own battles and not those of another. At present the fear is that they may be led into the firing line in a quarrel only outwardly their own. The Turks are not wanting in gratitude. In fact, few nations could equal the Turk in those characteristics which have extorted for him even from his enemies the title of “The Only Gentleman in Eastern Europe.” To quote the old Arab saying mentioned by Gibbon, their women know not how to grant favors and their men know not how to refuse. Every Indian whom we know who has had any relations with them is loud in praises of their courtesy, which is as natural to the peasant as to the price. But if courtesy is one of their qualities, they also possess the defects of that great quality. In matters of business they are imposed upon, and often imposed upon knowing that they are being imposed upon. Now nothing is a more serious business than war in which a nation can destroy in a month in the way of life, energies and resources what it had taken a generation to build. The Turk knows not what fear is, but life can be valueless only to those in the lowest scale of humanity. It is a rich treasure and a divine gift which we are not permitted by our Maker to squander. We must learn in war even more than in peace the importance and value of economy in human life. Unfortunately I don’t have a copy of the second item (‘The Future of Islam’) at present, but excerpts from the rest are going to be shared on this blog. Thoughts on the Present Discontent by Muhammad Ali Jauhar is the cornerstone of historiography of the Indian Muslim community in modern period. It was published in 1907, first as a series of articles in the press and then as a booklet. 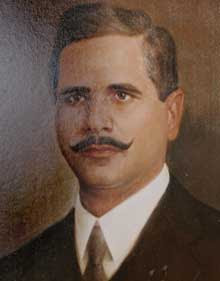 It gave Jauhar an instant popularity as a journalist, and established him as a leading spokesperson for his community. It's a pity that his writings are not included in the syllabi of English literature and media sciences in Pakistani universities. Perhaps this will change if we all make an effort to make his writings more widely known? and the Germans would boastfully proclaim from housetops, the English would disguise with the most praiseworthy pertinacity. It is this trait of their character which makes alien nations suspect them of conscious hypocrisy. They feel annoyed if other people take them at their word. "We rule India for India's benefit only," says the Anglo-Indian. Yet no philanthropist was ever so persevering in doing good to others against their will. Every civilian talks of exile, and yet I fancy there is not a little regret when the would-be Governor is denied by the examiners the privileges of martyrdom and life-long exile. Such pugnacious altruism and persistent philanthropy are liable to be misunderstood. A little more self-introspection and cynical frankness could sweep away much of the prevailing discontent. A writer in the Empire Review from Johannesburg has put the case with true Colonial directness. "It is not to-day nor to-morrow," says he, "but the day will come when the Indians can justly claim they can rule themselves, and then we must cast aside hypocrisy, and either acknowledge we do not govern India merely for India's benefit, or we must retire. Self-interest in trade is why we rule India, and not pure philanthropy. It remains to be seen which we stand by." You can read a lerger excerpt in the archives of the Republic of Rumi Website. Iqbal: Tashkeeli Daur (1905-13) is the second volume of my comprehensive biography of Iqbal in Urdu, and just now I received the first copy out of the press. I have already presented a synopsis of these phases in Iqbal: An Illustrated Biography (2006), which I wrote in English but which is now being translated into several languages, including Urdu, regional languages of Pakistan, Pesrian, German, Bosnian and some others. The serialized Urdu biography is different on several accounts, and there are a few aspects which I would like to share on this blog too. "Much may be done by means of a little knowledge, and knowledge should not be separated from action," says the 11th Century Sufi, Ali Hajweri (Data Ganj Bakhsh) in the first chapter of his seminal work Revelation of the Mystery (Kashful Mahjub). Here is the opening passage. Knowledge is immense and life is short: therefore it is not obligatory to learn all the sciences, such as Astronomy and Medicine, and Arithmetic, etc., but only so much of each as bears upon the religious law: enough astronomy to know the times [of prayers] in the night, enough medicine to abstain from what is injurious, enough arithmetic to understand the division of inheritances and to calculate the duration of the idda [the period within which a woman, who has been divorced or whose husband has died, may not marry again], etc. Much may be done by means of a little knowledge, and knowledge should not be separated from action. The Prophet said, “The devotee without divinity is like a donkey turning a mill,” because the donkey goes round and round over its own tracks and never makes any advance. Some regard knowledge as superior to action, while others put action first, but both parties are wrong. Unless action is combined with knowledge, it is not deserving of recompense. Prayer, for instance, is not really prayer, unless performed with knowledge of the principles of purification and those which concern the qibla [the point to which a Muslim turns his face while worshipping, viz. the Kaaba], and with knowledge of the nature of intention. Similarly, knowledge without action is not knowledge. Learning and committing to memory are acts for which a man is rewarded in the next world; if he gained knowledge without action and acquisition of his part, he would get no reward. Hence two classes of men fall into error: firstly, those who claim knowledge for the sake of public reputation but are unable to practice it, and in reality have not attained it; and secondly, those who pretend that practice suffices and that knowledge is unnecessary. It is told of Ibrahim b. Adham that he saw a stone on which was written, “Turn me over and read!” He obeyed, and found this inscription: “You do not practice what you know; why, then, do you seek what you know not?” Anas b. Malik says, “The wise aspire to know, the foolish to relate.” He who uses his knowledge as a means of winning power and honor and wealth is no savant. The highest pinnacle of knowledge is expressed in the fact that without it none can know God. Sehba Akhtar (1930-1996), who wrote ‘Mien Bhi Pakistan Hoon’ in the late 1970s, had also written lyrics for a parable about the tense relationship between the two wings of Pakistan filmed in 1968. Symbolically, the film was called Samandar (The Sea) because the two wings were connected only by sea (more than a thousand miles of hostile Indian territory separated them): “O friend, the sea is your friend and mine,” said Sehba in the title song (“Tera mera sathi hai lehrata samandar”). The film was produced by Waheed Murad (1938-1983). For the female lead, he invited a Bengali heroine who had never worked in West Pakistan before: Shabnam, who later became a legend in her own right. The parable, set in a community of fishermen, presented two friends. The protagonist (played by Waheed) wants to marry the chief’s daughter (Shabnam) while his friend (Haneef) wants to become the next chief. For this, he starts playing into the hands of an outsider whose main interest is exploitation. The protagonist beats his misguided friend in election but returns chieftainship to him after taking a solemn oath that he’ll protect the people. 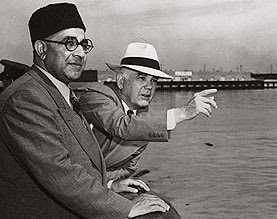 If the beloved is taken as the ideology of Pakistan, then West Pakistan becomes the lover while the leaders of East Pakistan at that time could be identified with the friend playing into the hands of the enemy (India later invaded East Pakistan). At the crucial moment (when the protagonist has to decide whether he should fight his friend in the larger interest of the community), people dressed in various ethnic costumes are listening to the famous Sufi song, “Lal mori pat” at the tomb of a saint while the singer is wearing a Jinnah cap – need we say more? Unfortunately the popularity of Waheed Murad as an actor has completely eclipsed the fact that he was one of the best screenwriters we have had in Urdu (he wrote four of his own films including Armaan). If this was the message of Samandar, then what else lies beneath the surface of eight other "auteur films" (films which he produced and also acted in them)? The series of “seven unknown celebrities” has been received better than expected. Looking at the works of Hafeez Jallandhri, Jamiluddin Aali, Sehba Akhtar, Masroor Anwar, Kaleem Usmani and Ibne Safi, we realize that spiritual and patriotic writing did not stop after Iqbal. It has been evolving. Before moving on to the seventh celebrity (who is going to surprise you for sure), I will share a few comments. I do sometimes feel at such a loss and now I MUST learn URDU to be able to read your Ibne - what a literary genius and visionary as well as role-modeling right living for the young! Obviously, a language prospers when it offers something not to be found in other languages. The unknown celebrities discussed here gave us what was our very own, and hence they were cherished by everyone. By ignoring them, we have been ignoring ourselves. Thanks for the Post on Ibne Safi. It's rather on time as well for his 29th death anniversary which happens to be on the 26th of July. Usually when we remember personalities from our past, its done with the memories from far down the history lane. In case of Ibne Safi we are remembering him with one of his about 40 years old masterpiece compiled under the title of "Teen Sanki," due to the fact that it is too current for our times. As you mentioned, it depicts symbolically what's happening in the Northern Parts of Pakistan today. The depiction is so vivid that it caught attention of many columnists in the media recently and we witnessed all sorts of comments on how it was possible for someone to write it so accurately, way back then. What should we call it: coincidence, vision, or foresight? Or was there something even bigger that manifested itself in form of a futuristic account of the state of affairs? We would have to think about it. One thing is for sure: we would have to dig through all works and find the solutions suggested/rendered by the writer in his works. This way at least we would find ways of solving our present day problems. Don't you think we need to give more attention to these "mystery novels" now more than ever? Ahmad Safi holds a doctorate in mechanical engineering in an area which ultimately leads to the possibility of finding answers to some of the questions mentioned by him in this comment. I am hoping that we shall find answers together, or at least he will. (P.S. One of the columns mentioned by him can be found in the RR Archives). Ibne Safi (1928-1980) is unique among fiction-writers of Urdu. He was equally popular in India and Pakistan (in India his books were also available in Hindi editions with the names of Muslim protagonists Faridi and Imran changed to Vinod and Rajesh). This was quite an achievement if we remember that unlike some other writers of that time, Safi's purpose was to inspire patriotism (he wasn’t indifferent to religion, sovereignty, national identity and foreign policy, all of which were disputed between Pakistan and India who went on war more than once). That Safi was able to infuse patriotism on both sides of a war-torn border is remarkable (despite the promotional powers of Eon Productions, James Bond could never become acceptable for “political others” behind Iron Curtain). Safi’s readers included intellectuals, cabdrivers, presidents and prime ministers (PM Nazimuddin and President Ayub Khan are said to be among his readers while Indian politician and later PM Lal Bahadur Shashtri presided over the launch of one of his books). Many who couldn’t read would listen to these stories being read out while the depth and variety of allusions in his 240 books was greater than any other writer in Urdu except Iqbal – and just like Iqbal, his works seem to be becoming more relevant with the passage of time. In 1975, he wrote a series of novels about Shikral, a fictitious region based on FATA. In the story, people are “disappearing” from Shikral and transported to a far-off island where they are being kept in cages. “A battle of mind is fought alone,” says the hero Ali Imran. “One doesn’t need an army for that.” Can you see the relevance? With feelings, I send this message from my leader as my personal note of felicitation to American friends on the 4th of July. I believe that your people earnestly desire peace. We, who have just begun to live, can hardly wish for annihilation to overtake us when we have not yet taken our first few breaths. What can we do to maintain peace in the world beyond keeping our own house in order? It seems to us in the East that only those who can make war can primarily maintain peace. If they are in earnest about it, is their way not clear? Firstly, is aggression to be defied only where we dislike the aggressor or is aggression to be defied in all its forms, big and small, and wherever it may appear? If the first, we will be doing no honor to democracy or justice or freedom but to the principle of biological survival. If the second, we will be serving the cause of freedom everywhere and giving hope to new nations. Secondly, is defiance, however stimulating it may be, enough? Are there not vast fields for constructive effort by which alone can enduring peace be built up? Yours is a great country with enormous resources of wealth, experience and technical skill. We, who believe in individual initiative, effort and enterprise do not believe that the era of private ownership is over. But we do believe that we have entered upon an era when capital should come out of its shell and move in the spheres of international social objectives and move on from exploitation to production. Your country fought for its own independence once. You have been great exponents and the jealous guardians of freedom. Words from your Declaration of Independence and your constitution have inspired men in far-off lands. You have shown to the world what human effort can do for human welfare. You have no colonies and I believe no territorial ambitions. Has not your history therefore equipped you more than most nations to be among the leading architects of the enlightened internationalism of the future? We Asiatics in general and Pakistan in particular are waiting to see what your answer will be. We do not know what you will say but should you decide that construction is the best way to defy destruction, you will find the people of Pakistan amongst your staunchest friends. I have spoken to you with great candor and from the depth of my heart for we are a simple and frank people as you are; we hold our freedom dear as you do and we love peace, if possible, even more than you do. University of California, Berkeley, on May 16, 1950.
until you lift your downcast eyes and smile. These lines from 'Khamosh Hain Nazaray' have the same ethos as the national song quoted above, as here again it is the people who bring meaning to the beauty of their landscape. I hope you will agree with me that Kaleem Usmani was someone who should be remembered.